Army General Chiwenga to be Named Zimbabwe Vice President? Former finance minister Ignatius Chombo. 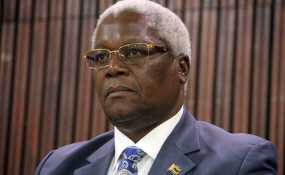 FORMER Finance minister Ignatius Chombo and deposed Zanu PF youth leader Kudzai Chipanga were denied bail by a Harare magistrate on Monday. Their lawyers immediately indicated that they would appeal the decision at the High Court on Tuesday. The two former ruling party officials spent the weekend in custody after appearing in court Saturday pending the bail ruling. Court heard that they were abducted by unidentified men in military uniforms and spent days in detention before being handed over to the police last Friday. They are believed to have been rounded up as part of the military intervention which led to the resignation of former president Robert Mugabe.